Italian Wedding Soup is warm and comforting and filled with tender chicken meatballs, carrots, spinach, and acici de pepe. 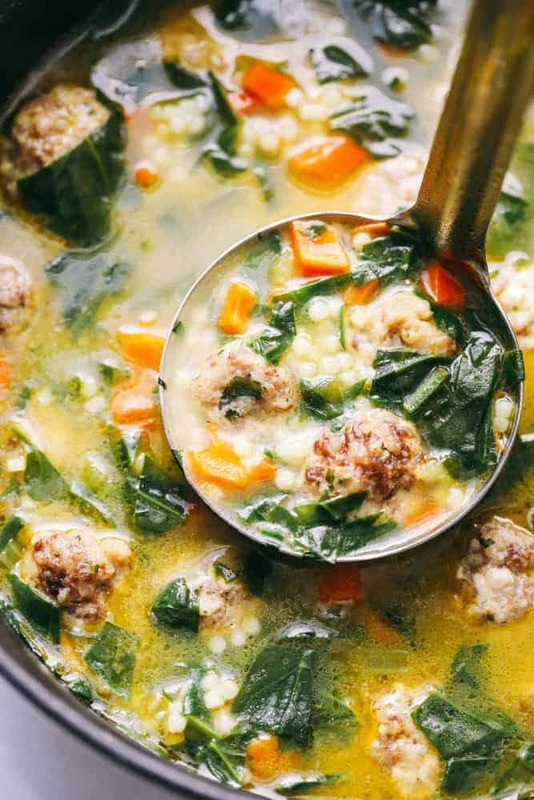 This classic Italian soup will become and instant family favorite! We love a good warm bowl of soup at our house. This soup is full of flavor, comfort and all blended together for perfection! This is a light and tasty soup that leaves you filling full. Bite after bite of this soup leaves you wanting another bowlful warmed up. You will love this simple comfort soup that will give you all the feel goods you need. You also need to try this Slow Cooker Chicken Tortellini Soup, Pasta e Fagioli Soup, or this Panera Broccoli Cheese Soup. One thing we absolutely love is traveling to new cities and trying out different foods. 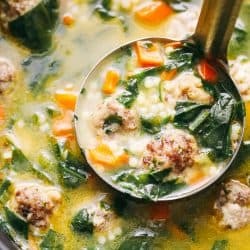 We recently went to a new Italian restaurant as a family and the waitress told me all about this Italian Wedding Soup and that it was her favorite. 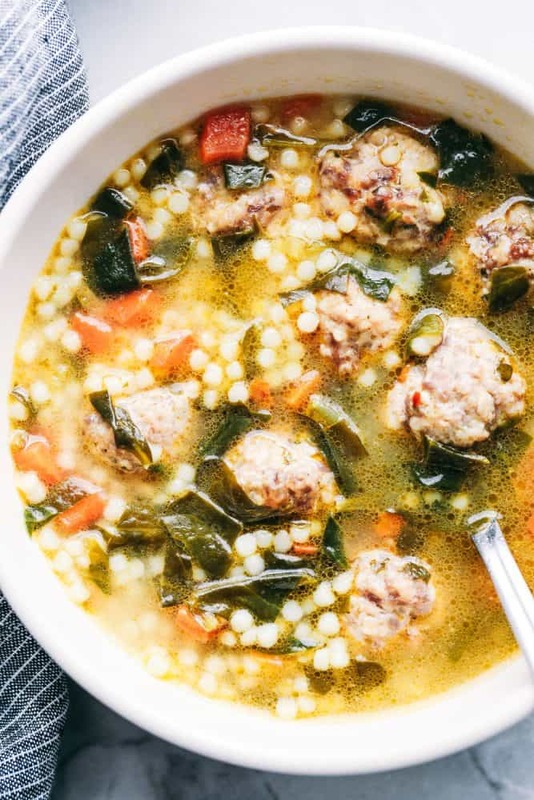 I can’t believe that I had never heard of Italian Wedding Soup before. It honestly became one of my favorite soups with the first bite. There is so much to love about this delicious soup. My favorite part was the chicken meatballs that were hidden throughout and the tiny acini de pepe pasta inside. As soon as I had it I knew that the recipe needed to make a debut on the blog. This soup is actually really simple! It comes together within 30 minutes and has so much delicious flavor. You are going to LOVE it! 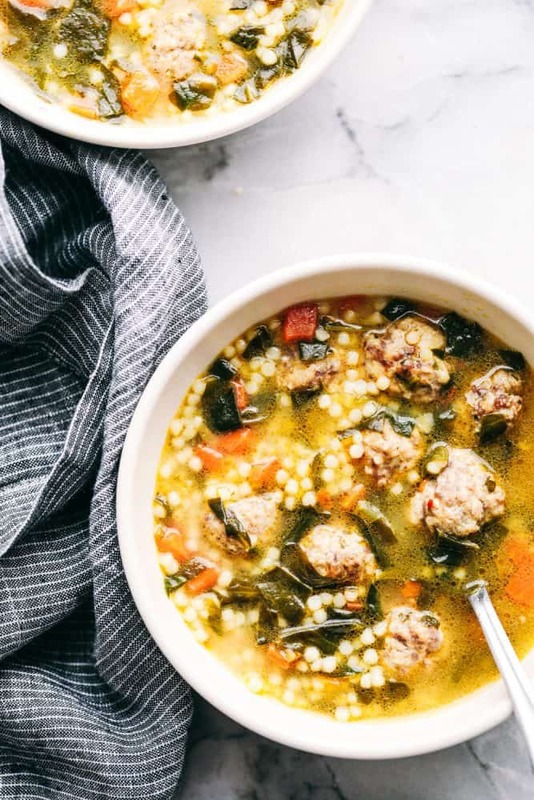 What is Italian Wedding Soup made of? What is Acini de Pepe pasta? The name in Italian means “seeds of pepper.” They are known as a symbol for fertility and that is why they are used in Italian Wedding Soup. They are also sometimes referred to as Pastina, (Italian for “tiny dough”) but some pasta makers distinguish pastina as smaller than acini di pepe. 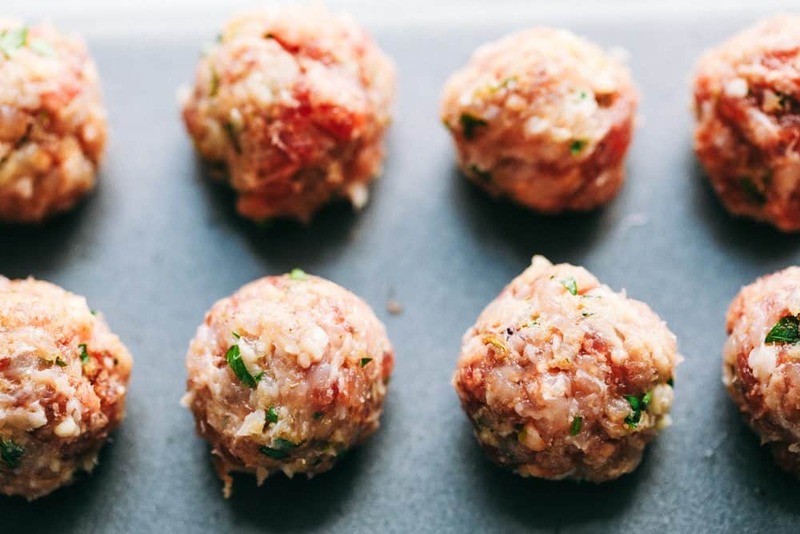 To make the meatballs: In a medium sized mixing bowl, add the ground chicken, chicken sausage, egg, Italian seasoning and salt and pepper. Stir until combined. Roll into one inch meatballs making about 25-30. In a large pot add the olive oil, onion, carrots, celery and garlic. Cook for 2-3 minutes or until tender. Add in the chicken stock, pasta and meatballs and bring to a boil. Reduce heat to a simmer and cook for about 10 minutes until meatballs are cooked through and pasta is tender. Stir in spinach and allow to wilt. Season with salt and pepper and top with freshly grated parmesan cheese. Yes! 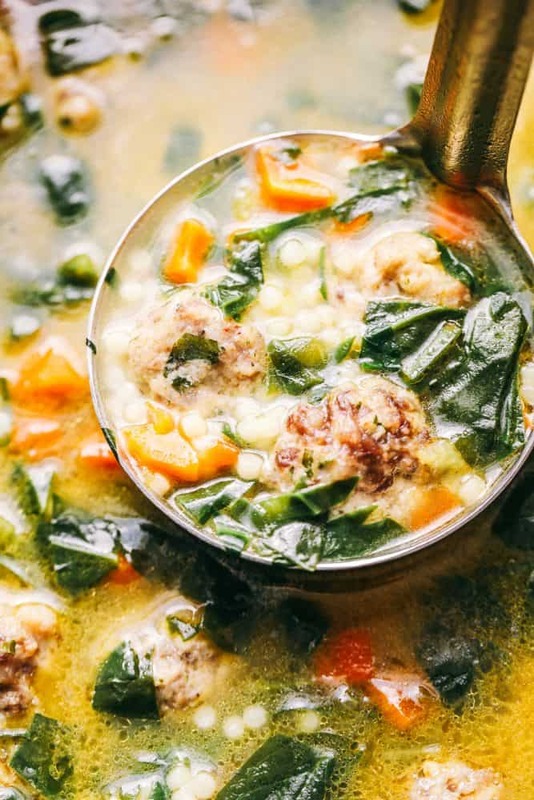 This is a great soup that can be frozen either into individual sizes or family sizes to reheat on those days you just need something warm and comforting. The best way to freeze this soup is with a ziplock bag, plastic or glass Tupperware, or using a food saver machine. It is best to let the soup cool before adding it to the freezer container. You will add your soup into an airtight container that is mentioned above leaving a few inches from the top to seal the container if using ziplock or food savor containers. After letting the air out and closing it tight, lay the soup on its side for best storing in the freezer. This makes it stackable for easy storage. To reheat this soup, it is best to either thaw it by storing it in the refrigerator over night. When ready to reheat you will warm the soup back up on the stove or in the microwave before serving. Want More Soup Recipes? Here you go!